Sheffield FC is the worlds oldest football club, having been formed in 1857. They played in local leagues, mainly the Yorkshire league for most of their history, before joining the NCEL Division 1 in 1982. They won the league in 1989 and gained promotion to the League's Premier Division. However, despite finishing 9th in their first season at this level, they were demoted due to lack of floodlights. This was soon remedied and they won the league in their first season back. Mixed seasons at the new level continued, but they survived and eventually prospered, gaining promotion to their current league, the NPL Division 1 South in 2008. Since then they have finished in the top half every season since, and have missed out in the playoffs on a couple of occasions. Their record finish of 4th came in 2012. In the early days of the FA Cup, they reached the Quarter Finals on more than one occasion, and in modern times they have made the 4th Qualifying Round on a couple of occasions, which is impressive for their league status. They won the FA Amateur Cup in 1904 and were FA Vase finalists in 1977, losing to Billericay Town after a replay. In their short time in the FA Trophy, they have made the 3rd Qualifying Round on 2 occasions. This season they were having a disappointing time, lying 15th in the table at the time of the game, and on course for their worst finish in this league yet. For the second part of my football and Coronation Street trip I wanted to go to an NPL game if possible. I had been to a lot of the grounds and the only one that really fitted the bill was Sheffield FC. It was also a tiny bit closer to home, which would aid me as I had a 4am start the next day. Another bonus was that I could park up at the ground, walk into Dronfield where the club is based and get a train into the excellent city of Sheffield, with its wealth of good pubs, food places and shops. I woke up at 7.30, having a bath and a healthy breakfast of a packet of crisps. I checked out of my hotel at 8.20, and it took me till 9.10 to drive the 8 miles into Manchester, so it was just as well that I left enough time. 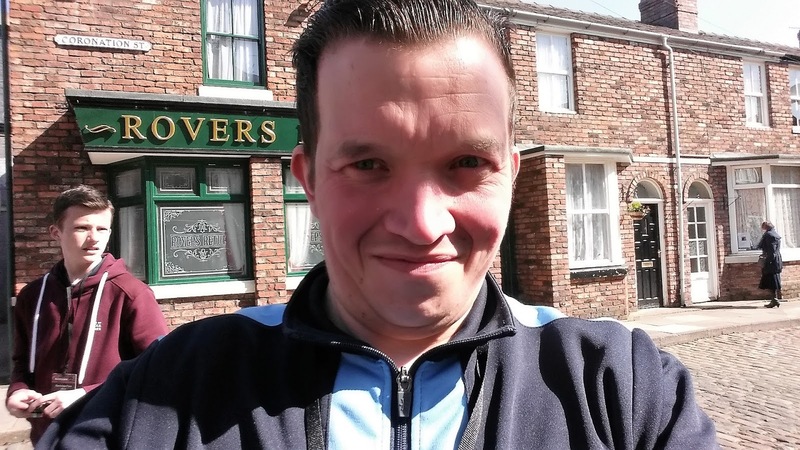 I parked up and walked to the set of Coronation Street, arriving around 50 minutes before the start of my tour. I killed time by sitting in the old staff canteen and having an all-day breakfast roll. The tour itself was very good, though it was a bit annoying that you couldn't take pictures of the inside sets. We saw Carla's flat, the Platt's living room, the Underworld knicker factory and the barge that Ken Barlow had his affair on amongst other things. And if course the Rovers Return, where you could get a professional photo taken of you behind the Rovers Bar. It cost £8.50 to have it on a USB stick, and that was the only thing that I bought in the gift shop as it was quite expensive. Overall though, the tour was excellent and well worth the effort and £16.50 that it cost to go on. And you were allowed to get some pictures of the outside set, so I got a few close-ups of the shops and houses, as well as a few selfies. I was finished at about 11.40 and drove to Dronfield Town. The route was beautiful and scenic, though it was very annoying sat behind lorries that drove at half the speed limit. I got to Dronfield at 1.30 and got a few pictures of their ground. 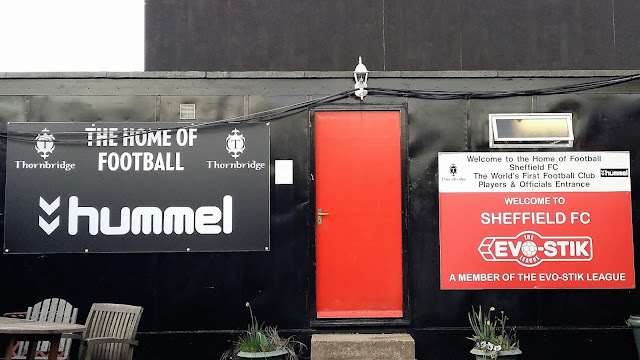 It was pretty nice and decent for the level that they play at (NCEL Division 1) I then drove to nearby Sheffield FC for the nights game, but parked up and walked just under a mile to Dronfield train station. Annoyingly it was a 45-minute wait for a train, as they only run at 2 and 15 minutes past the hour, totally pathetic and left me wishing I'd planned for carefully to cater for the unexpected poor service. I killed time by going to a local shop to get a bag of crisps and the local paper which was a special edition to commemorate 25 years since the tragic Hillsborough Disaster. The government of the time are rightly still receiving criticism for the handling of the incident, and it was also them that sold off all the trains so that they now run for the benefit of the company's shareholders as opposed to the passengers. I finally got my train just after 3 and from there it was 10 minutes into Sheffield. First port of call was The Rutland Arms, which has received excellent reviews for its cider selection in the pub Mecca that is Sheffield. It was only 5 minutes from the station and I was installed in the bar by 3.20. First off was half of 'Ten Years Later' cider, followed by half of Tutts Clump, which had travelled around the same distance as me, being that it was from Berkshire. I looked at my train app on my phone and deduced that either 5.45 or 6.05 was the best time to get my train, so I bore it in mind before having a look round the shops. I went to Pound Bakery for some cakes, then Poundland for some drinks (I take it you are noticing the usual cheapskate theme here!) I then put Cash Converters in my Sat Nav in hope of picking up some cheap PS2 games. However, I stopped at a bookshop and picked up a book about dugouts (sad git I know) By the time I got to cash converters I was 5 minutes too late for their 5pm closing time. I decided to go back to the station, but not before going to the Sheffield Tap for half of Janet's Jungle Juice. It was one I had had in Rugby before but was a really nice one, so I didn't mind having it again. I got back to Dronfield at 6.20 and stopped a local Indian restaurant to get a keema naan, which was great value at only £2. I then made my way to the ground. Seen as it was still over an hour to go till kick off I went and sat in my car for a while and listened to TalkSPORT, who were previewing the evenings' games. At around 7.10 I went into the ground and got a programme. After going round and getting some pictures, I got myself some chips and gravy and Bovril and took a seat in the stand. As for the game, it saw lower mid-table Sheffield face leaders Halesowen Town. Be Haseley had given the visitors the lead before they had a goal disallowed on the half-hour mark as the referee ruled the ball had gone out of play before it had been crossed. It must have been a good half time team talk as Sheffield were level within 3 minutes of the restart, Corey Fereday finding the net from just inside the area following an Andrew Gascoigne Cross. 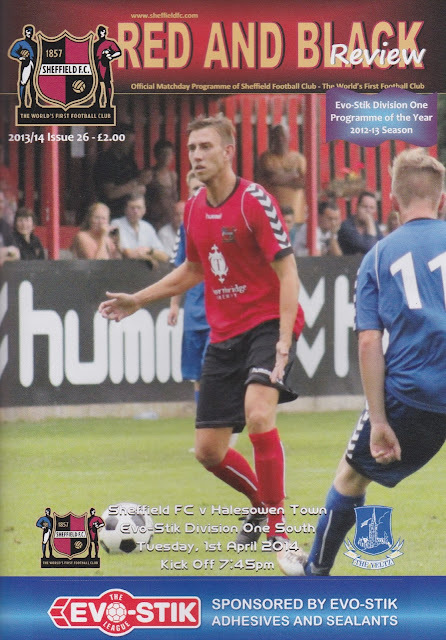 Halesowen were soon back in front though, Haseley getting his second finishing a winding run with a neat finish. But the hosts again equalised, a Ben Turner Cross diverted into his own net by a visiting defender. Halesowen got the winner after they netted from close range after a corner had not been cleared properly. After the game I made a quick getaway, setting up my phone so that I could listen to Pete Price on Radio City in Liverpool through my car stereo. It meant that I would be using up lots of data as it was online radio, but seen as I have run out of my allowance and now pay £1 a day regardless of how much or how little I use, I was going to get as much value from it as I could. 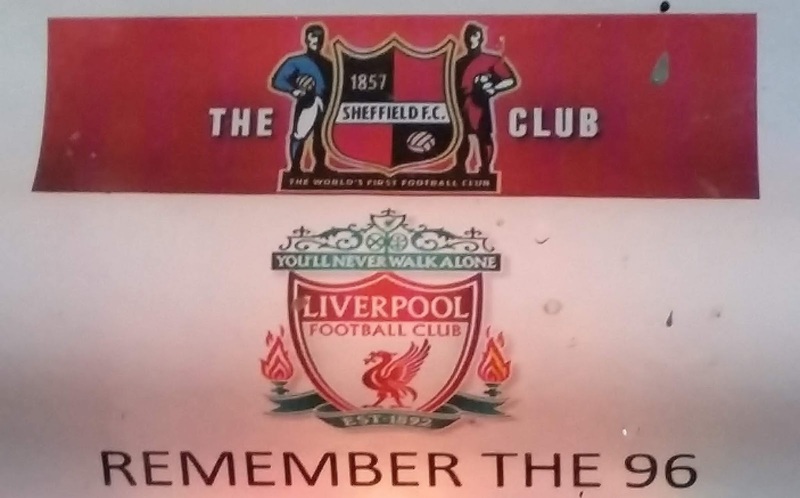 As with other stations, and unsurprisingly seen as they were based in Liverpool, a lot of the conversation was geared towards the Hillsborough anniversary. Usually, you get people calling in and trying to wind the presenter up, but these sorts of calls were thin on the ground tonight. I made very good time getting back and got back to my house just on the stroke of midnight. I couldn't get to sleep till after 1.30 and so only had a couple of hours sleep before I was up at 4am for work. THE COACH AND HORSES GROUND is quite unique, in that it is in a bowl. a bit like Lewes' Dripping Pan really. 2 sides of it are open, whilst the seated stand is behind the goal and holds around 300. There is further covered terracing along the side for around 500. The club shop doesn't have a huge range of stuff and is quite pricey, although a lot of the products are pretty smart. The tea bar has a great range and what I had was very nice. 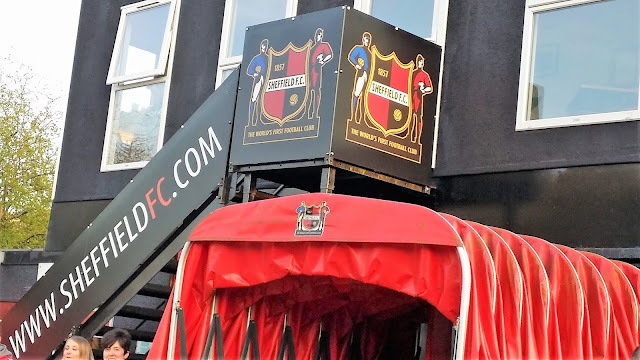 There wasn't a clubhouse that I saw, but I've got a feeling that the excellent Coach and Horses pub acts as this, and if so, must be one of the best clubhouses in football. The town is a 10-minute walk away if you fancy a wider range.